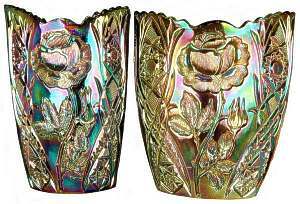 It was the (late) Raymond Notley who originally put the name Brockwitz into the Carnival Glass vocabulary, and it triggered an enormous amount of research and further, significant discoveries by us and by other researchers. In the early 1990s, we worked with glass researcher, Bob Smith and were able to document many Brockwitz patterns and shapes, through the catalogues that Bob had sourced. We also worked with Siegmar Gieselberger in Germany, and even more catalogues appeared for study, courtesy of Dieter Neumann. Today we have an almost unimaginable resource of information at our fingertips - and still fresh items continue to be discovered. 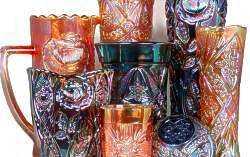 In 2006 we, and CGS (UK) Carnival Glass collectors put on a magnificent display of Brockwitz Carnival Glass, so unique and utterly show-stopping that it was undoubtedly an International First. It was impressive, comprehensive, educational and mind-blowingly beautiful. Almost 150 pieces of glass and 40 different patterns were shown in the display, including some that we hadn’t even seen before. What is fascinating about Brockwitz is that previously unknown shapes and patterns still turn up. 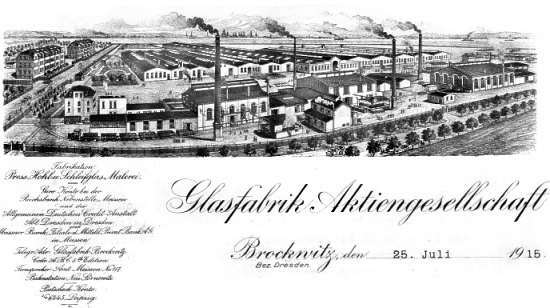 The first pieces of glass were poured in the Brockwitz glass factory in January in 1904. Three hundred workers were initially employed. In ten years their numbers had doubled, and had doubled yet again to a staggering 1200 workers by 1927 - a phenomenal rate of growth. Typical German efficiency and skill, clever investment, and a naturally good location had resulted in the rapid rise in growth and output. The glassworks was massive: located on the bank of the River Elbe in Saxony, it had great transport links as well as a cheap, local supply of fuel - lignite, known as brown coal. Brown Gold more like! Tax free and easy to excavate, the lignite was converted into gas to power the eight melting furnaces at the factory. Brockwitz had grown fast, its output was top notch and its reputation spread quickly - and it was devoted entirely to the mass production of quality pressed glass. A special visit to the factory was organised in 1928 by a group of English glassmakers. Their report lets us step back in time some 80 years to see the factory as they did. The study group noted that there was a huge amount of room for both factory expansion and also to provide housing for the workers - not something that was typically done in English glass works. When did Brockwitz begin making Carnival Glass? It began much earlier than it had previously been thought. 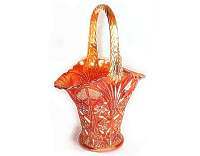 The received wisdom was that Brockwitz Carnival Glass was made in the period from the mid 1920s to the mid 1930s. However, in 2005, a 1915 Brockwitz Pattern Book was shared by Dieter Neumann. 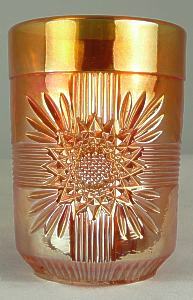 Shown inside were illustrations of the designs we now call Rose Garden (Rosen) and Curved Star (Zurich), with the astonishing notation under the vases - "GOLDIRIS" and "mit eingebranntem LÜSTERDEKOR". 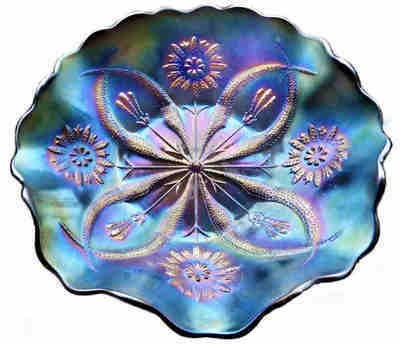 (fired on iridescence) – this was Carnival Glass (see images below). This was ground-breaking information at that time. However, our ongoing research into this maker has revealed much more about the early origins of Brockwitz Carnival production: we now have evidence leading us to believe that they were possibly making Carnival as early as c. 1905. Read our detailed investigation in this major feature: Untangling The Gordian Knot. 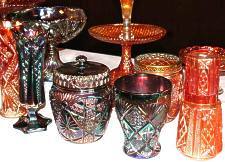 In the late 1920s Brockwitz was a major player on the international glass scene. Yet, 20 years later, it was on its knees, struggling to survive. Why? It was the Double Whammy of the Great Depression and World War II. During the war the factory had been mostly turned over to producing glass for military purposes (tank windows and glass weaponry). 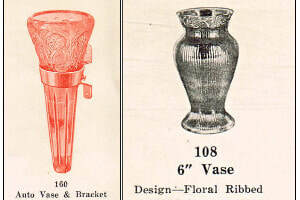 There was a 1941 catalogue, and there was still some domestic glass output, but it was small. After the war, Brockwitz was in the Russian controlled part of East Germany and all materials and tools were taken away to the USSR. There were a few attempts to revive the plant, but nothing really worked, and a fire in the 1960s razed what was left of the buildings to the ground. The glory that was Brockwitz was at an end. Their legacy lives on in some of the finest Carnival Glass in existence. Beautiful dazzling patterns – crafted with artistry and skill. Lustrous, scintillating iridescence - shimmering with colour and light. Magnificent, breathtaking shapes - from exquisite miniatures to majestic epergnes. Read and see more about Brockwitz - click on any image. Brockwitz and the Four Flowers Variant Mystery - SOLVED! Rose Garden - a mystery solved!